Style and elegance cannot even begin to describe these Signature Series Bronze Soccer Awards. The highly detailed soccer players are shown with the soccer ball at their feet, looking ahead to find the open spot in the goal and ready to kick the winning goal. The bronze metallic finish continues down to the base to complete the look. Plenty of room is provided for whatever your personalization needs might be. These awards are available in both male and female versions. Both version are available in five different heights, 6", 8 1/2", 11", 13", and 17 1/2" giving you the ultimate in flexibility for your awards presentation. These are the ideal awards for your soccer needs. 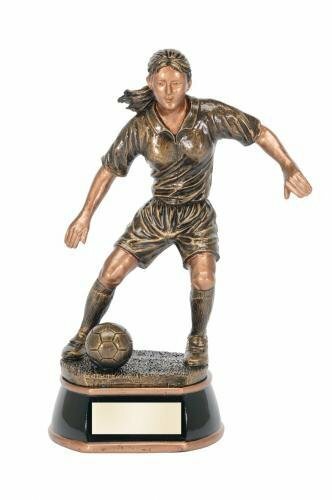 This soccer multi color sport resins gives you a unique and colorful award. The award showcases soccer icons of a soccer ball, cleats, and goal. 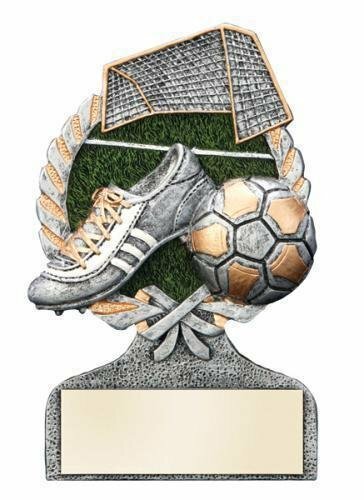 This full color version features a gold and silver paneled soccer ball, cleats with gold laces and white design markings, all against a green field background with a goal that completes the look. A wreath with a bow at the bottom bring the entire award together. 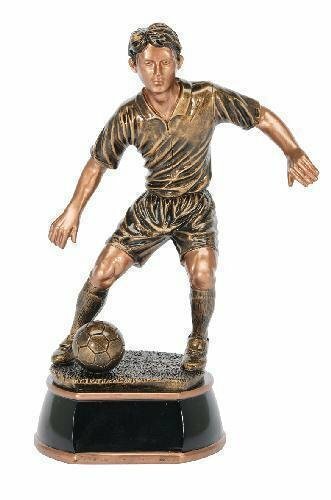 Standing 5" tall with plenty of room on the base for your engraving needs is sure to make this perfect for you next soccer award ceremony.